As an adjective, august is sometimes used to describe something or someone that is extremely impressive or has a grandiose quality. For this reason, when the term august is used, it often carries the connotation of being awe-inspiring or tremendous. A breathtaking view of the Roman coliseum or the pyramids of Egypt could usher someone to refer to the scene as an august picture. Even the way a brilliantly successful businessman walks into a room could be said to be august, especially to those who are working underneath him or striving to attain the prestige of such a position. In fact, to anxious students who are counting down the minutes to summer vacation, visions of the month of August can be quite august! However, your 93-year-old great aunt might seem august too, perhaps not because she is respectable, but simply because she is old and severe. Ancient monuments and deceased scientists can usually be described august due to their magnificence; many times their "age" helps them achieve this status. More often that not, people or things are august because of the weight of influence they have had on others. However, honor does not just come with age; a young person with a considerable reputation or a promising new idea could also qualify as august. You never know: your great aunt may have had quite the following of suitors that fell for her august qualities. The noun, August, within regions that follow the Gregorian calendar, refers to the eighth month of the year, which precedes the month of September and follows the month of July. This month contains 31 days. Also depending on one's region, specifically in the northern hemisphere, August is often seen as the unofficial last month of the summer season. August vs. august: August the month can often be distinguished from august the adjective by the capitalization of the proper noun, as well as the lack of emphasis placed on the second syllable of the word (/aw-guhst/). Example: The august feeling that overtook the singer on stage caused her to ache for increased stardom. Example: When he walked through the august rooms of the Newport mansions he felt very insignificant in comparison. Example: V.J. Day, observed August 15, commemorates the end of World War II. It appears that the origins of the adjective august and the noun August are at least related, as both are taken from the Latin word "augere", which means "to increase". Scholars are quite certain that august had previously described something as having been "consecrated by the augurs", the equivalent of priests in the classical world. This "holy" and "praised" quality can still be found today, although there usually are not blessings involved. The adjective august can be seen as early as the mid-17th century carrying its modern meaning. The origin of the noun August can be traced all the way back to the year 8 B.C., when the Roman government renamed the sixth month after their first emperor Caesar Augustus. 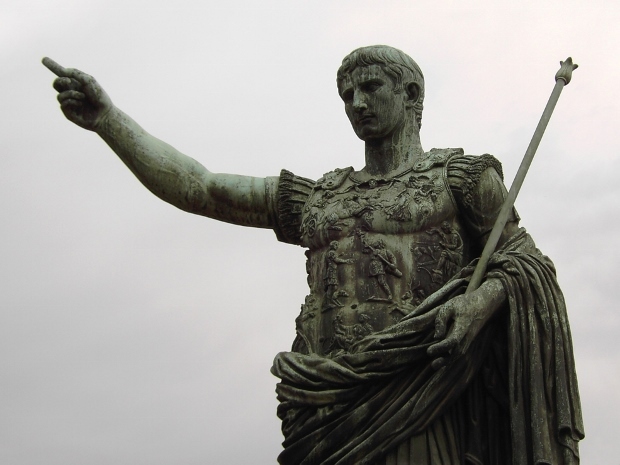 Augustus, at that time, was used as a formal title or name that translated as "venerable" or "honorable", making it a fitting identification for a mighty ruler. In 1097, Augustus was shortened to the more familiar August, now labeling the eighth month of our calendars. Borgia, thou once wert almost too august And high for adoration; now thou'rt dust; All that remains of thee these plaits unfold, Calm hair, meandering in pellucid gold. Here, Landor describes Lucretia as being too great and magnificent to require further admiration from him. He believes that any accolades from "lesser" subjects such as him were not worthy of or expected from the regal woman. Now that she is gone, he remembers her for her beautiful hair, which seems to have lost its luster in her casket. August is sometimes used as a first name for boys, although there are feminine forms usually created with the inclusion of an "a" at the end of the name. This modern take on the classical name still carries a tinge of royalty. That bust of Caesar was just august. To be honest, August is the hottest month. Bring out the linguist in you! What is your own interpretation of august. Did you use august in a game? Provide an example sentence or a literary quote.